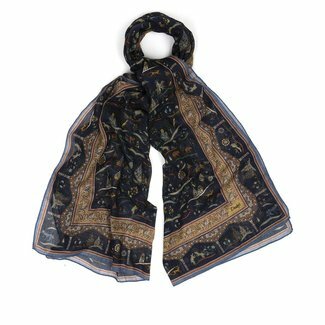 Unique navy scarf with a Mughal print, made of a cotton-cash..
A bold scarf with board stripes in the colors red, yellow an.. 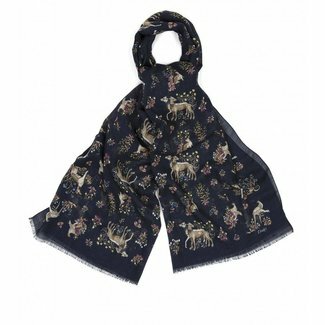 Unique navy scarf with a dog print, made of a wool and silk .. 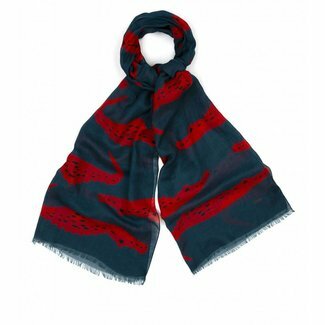 Unique green scarf with a dog print, made of a wool and silk..
Drake's blue men's scarf with a red crocodile design. 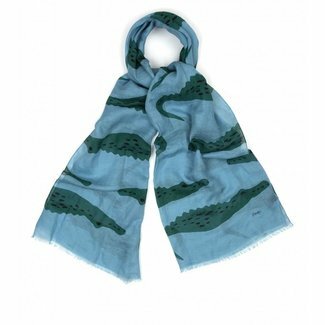 The sc..
Drake's men's scarf in a light blue colour with an crocodile.. 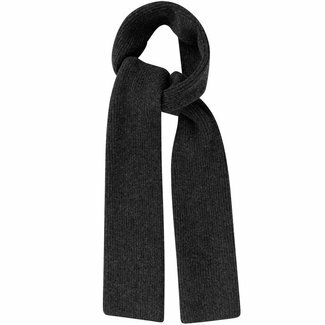 This Begg & Co scarf in a lambswool and angora mix is made o.. 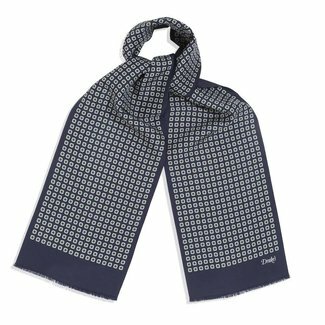 If you are looking for men's scarves with a contemporary look, you can succeed here. 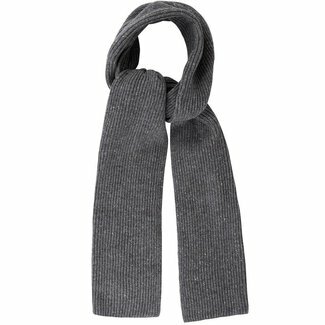 Men's scarves are not only practical but also fashionable. That more and more men wear this accessory is a fact. If you want to look stylish, it is important to choose one of a good quality. 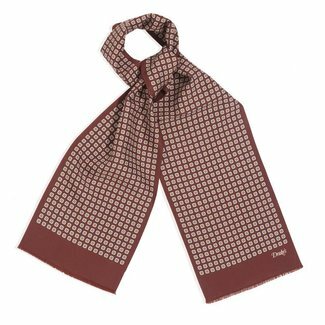 Scarves for men are available in many styles and different material combinations. 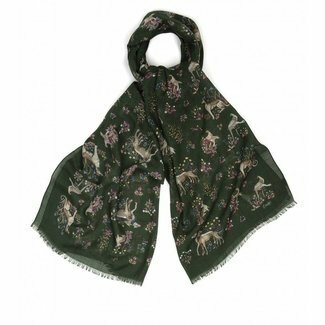 If you buy a scarf, we advise you to take into account the season in which you want to wear the accessory. 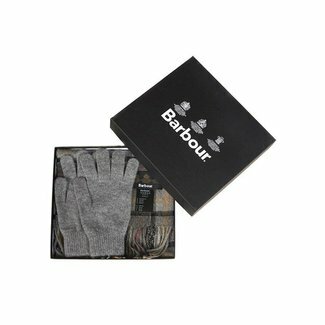 By choosing the right material for the right season you benefit from optimal comfort. A cotton blend is ideal for spring and summer days, to defy the winter cold you should choose a woolen variant. 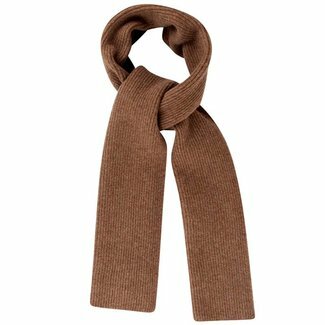 A warm winter scarf for men is not a luxury for the cold and harsh days. 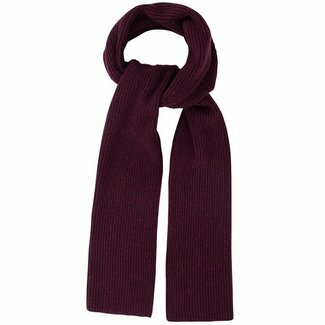 This period of the year is best for a merino wool scarf, the accessory must meet one important requirement and that is to protect against the cold. The natural material merino wool is very soft due to the long, thin structure of the fibre and also wonderfully warm. 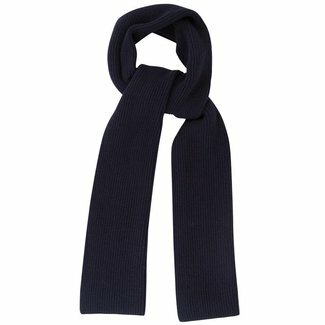 Knitted men's scarves of wool are available at Quality Shop in various colours such as navy, black and beige. The dark and natural shades are timeless and easy to combine with different dressing styles. 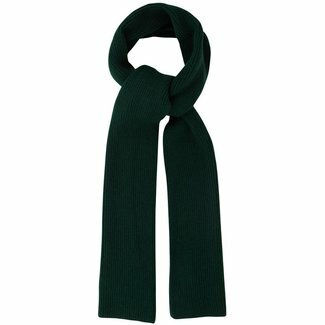 In addition to plain coloured winter scarves from the brand Mr Crevan, you will also find the Donegal variant. Donegal is a fabric with a subtle speckle in a contrasting colour and gives the accessory just a bit more depth. 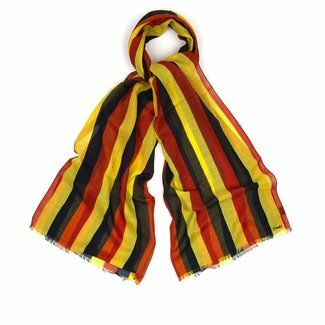 Prefer a coloured men's scarf? Then we recommend you to take a look at Drake's exclusive collection. Also in the spring and summer, it is not uncommon to style your look with a thin scarf. For this, you can choose from Drake's collection. For the collection for the spring and summer the materials modal, cotton, cashmere and silk are used. Often, it is a blend for optimal quality. 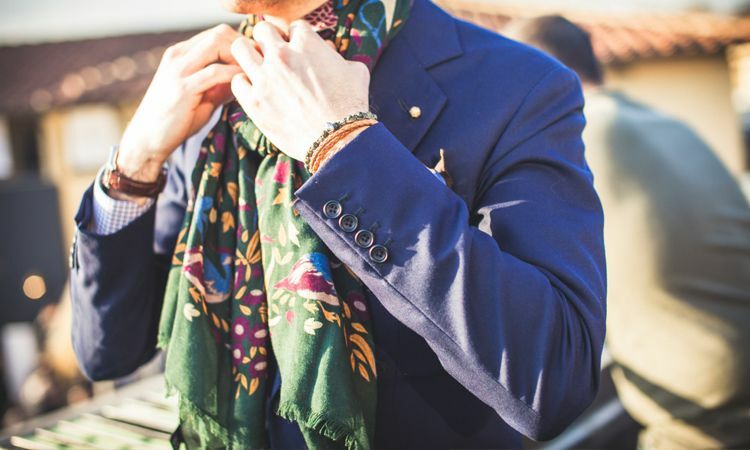 The men's summer scarves from Drake's are unique because of the prints and stylish use of colour. 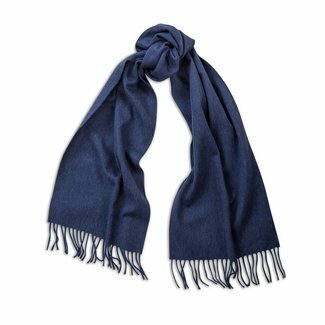 Why buy scarves at Quality Shop? A couple of years ago, a scarf was only worn during winter days. Nowadays, it is an accessory that is worn during all seasons. 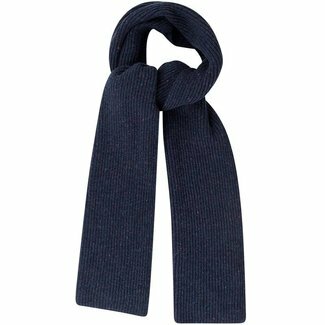 Whether you want to defy the cold or add a bit of flair to your look, you can distinguish yourself with a high-quality men's scarf. 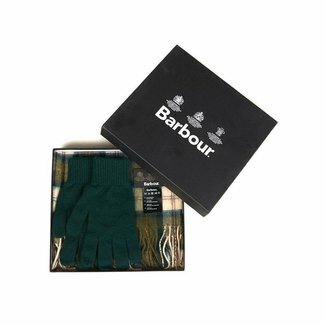 Buying luxury men's scarves is easy at Quality Shop. You can choose from a wide collection of plain knitted to exclusive designs. 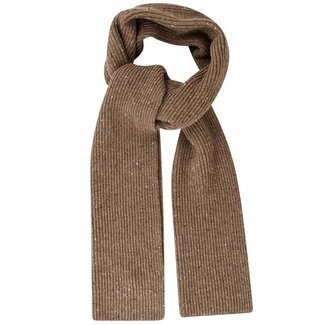 There is a suitable men's scarf for every season.